Peak Oil Debunked: 297. HOW ABOUT THOSE ANOMALOUS INCREASES IN OPEC RESERVES? 297. HOW ABOUT THOSE ANOMALOUS INCREASES IN OPEC RESERVES? Note that OPEC production quotas are in part dependent on proved reserves - giving these countries an incentive to exaggerate. The huge jumps in reserves were not associated with the discovery of any particular large new fields. These time series are extremely implausible on their face and suggest mendacity. In a nutshell, the peak oilers are saying the OPEC countries are lying. They fraudulently inflated their reserves to expand their production during the "quota wars" of the 1980s. Non-OPEC countries have no incentive to exaggerate their reserves to secure larger quotas, and yet look at the reserve growth. Non-OPEC reserves grew by about 28% from 1980 to 2004. Even more astounding is this. Working from the BP figures, we find that in 1980, the non-OPEC countries had 232.5Gb of reserves, and in 2004 they had 298.2Gb of reserves. In the period from 1980 to 2004, the non-OPEC countries produced 376Gb of oil. This means that, over 24 years, the non-OPEC countries produced 160% of the reserves they had in 1980, and still ended up with 30% more reserves than they started out with it. So Campbell's point that the OPEC reserves "have barely changed since, suggesting that subsequent production has not been deducted" is obviously a crock. If we simply deducted non-OPEC production over 1980-2004 from non-OPEC reserves in 1980, non-OPEC would currently have reserves of -143.5Gb. The actual value is +298.2Gb, so (as I said) Campbell's criticism is a crock. One example should suffice to demonstrate the underlying principle. Norway in 1980 had 3Gb of reserves, and by 2004 this had increased to 9.7Gb, an increase of 169%. Meanwhile, in the period from 1980 to 2004, Norway produced 18Gb of oil -- 6 times more oil than they had in reserves in 1980. So what is so surprising about a doubling of Middle East reserves, despite constant production, over the same period? Norway wasn't involved in any "quota wars". Why do peak oilers assume that Middle East reserves should have remained constant or declined over that time, while Norway's didn't? After all, the Middle East is where, we all admit, most of the remaining conventional oil exists. The bottom line: Increases in OPEC reserves aren't anomalous at all, and are perfectly consistent with reserve trends worldwide. *) Here I am deviating from the nomenclature in the BP review, and using the term non-OPEC to refer to all countries outside of OPEC, including the former Soviet Union (FSU). In addition, riddle me this: if I can sell more oil now as long as I promise to develop more of the harder-to-grab stuff later in the future, do I? As long as it makes financial sense, then YES. Many forget that all reserves are not (or categorized) equal. If they could turn a net profit back then (even when earmarking funds for the necessary future investments into the infrastructure) then it was a good move on their part to grab the cash for the promise of developing this additional stuff in the future. Where's the conspiracy?? These kind of analysis don't really say anything. Reserve based production forecasts are very unreliable. Although it is still interesting I wouldn't make any bet based on reserves. Maybe a cross comparison between discoveries in Non-OPEC and OPEC will help. Rembrandt, the argument isn't concerned with production forecasts. It's simply about reserves growth. Campbell makes it sound like OPEC reserves should have stayed constant or declined since 1980. But non-OPEC reserves grow. So what's so special about OPEC that their reserves aren't supposed to grow? If the 1980 reserves estimates were the final, definitive estimate for OPEC, why weren't they the final definitive estimate for everybody else? Did technology and engineering progress everywhere except OPEC? Thing is, when you are looking at published OPEC reserves figures, you are looking at quota allocations. If an OPEC member revises its reserves, it is not just of academic importance but directly affects their quote. What strikes me about the reserve revisions is that they ended up more or less in the same ratio they started with, i.e they each have the same share of the pie. I think OPEC decided to keep the same share out of the oil revenue pie, and not get into leapfrog games. So the actual reserves figures could be a lot lower - or a lot higher. Although pretty important, we can only guess which. OPEC holds the cards, and they have no incentive to show us what they are holding. Is there any information on what led to the "reserve growth" (in both OPEC and nOPEC countries)? Was it new discoveries, or the realization that old fields had more oil than was originally suspected? Or was it new technology that would allow us to get at oil we knew was there but had no way to produce? Once again, thanks for the site and the work you do to help folks like me break through the "peak oil paralysis" that overcomes them after being introduced to the concept by doomer sites. Now lets hope the U.S. government realizes that the answer to our energy crisis isn't $100 bribes or suspension of gasoline taxes, but dense cities filled with affordable housing and mass transit. The way you do your research to make sure you know what you're talking about is fantastic. If everybody did that, we wouldn't have doomers to deal with in the first place. This is one of the most poorly argued posts on this site yet. 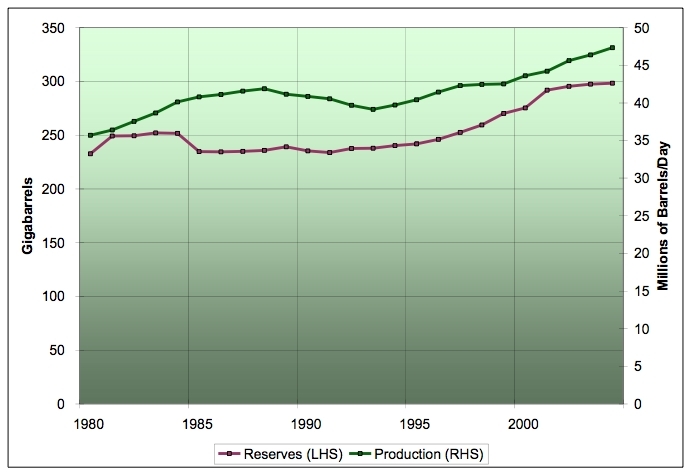 Yes, Norway's reserves also increased. Because they found large new fields! So, one would expect to see a large jump in Norway's reserves the year the fields were found. Conversely, in OPEC countries, we see large one year jumps from every country within a few years of each other soon after agreeing that production quotas would be based on stated reserves WITHOUT any major finds. So how is the comparison with Norway even remotely relevant? Yes, it's interesting that Norway produced more in the period than their stated reserves ever were, but that's completely irrelevant to the argument of whether the sudden OPEC increases were based on some new reality or purely political. Certainly, One can imagine reasons why country's reserves would jump in a year, like accounting changes. But every OPEC country? One right after the other? There was a clear incentive for them to increase their estimate and no evidence of new fields. Which, by the way, does not make the new estimates wrong, necessarily. Neither is there any reason to put much faith in them. Thank you SO much for this site. I was one of those doomers and was literally scared out of my mind. I was waiting for the world to end. Now I'm so pissed off for falling for it. Thanks for putting sanity back into my life. Did you actually look at the 2005 BP Yearbook? jd - If it is so obvious that OPEC increased it reserves then perhaps you can list the discoveries that came on line at that time to account for the increase. Certainly the way that OPEC updates its reserves its reserves is unorthodox, but there is absolutely no reason to believe that their reserves should not grow like every other country in the world. You are giving figures for 1984 vs. 2004. The post discusses figures for 1980 vs. 2004, hence the discrepancy. Also, as I said in the note, I am deviating from the practice in the BP Review by using the term "non-OPEC" to refer to "non-OPEC+FSU". Discovery is only one of the reasons why reserves grow. My next post will describe this more clearly so you can understand. I find that using a percentage to describe reserve growth is misleading. Reserve increases for individual non-OPEC countries don't exceed 10Gb, in absolute term they are very small increments and can be related to new discoveries. But for Saudi Arabia, you are talking about a sudden jump of 98Gb of new reserve without new significant discovery! OPEC countries do have incentive to exaggerate their reserve numbers, they were always concerned by the development of oil alternatives after the 70s oil shocks. They must create the illusion that we are literally drowning in cheap oil! It might clear up some of your misunderstanding and at least show how OPEC proved revisions are anything but similar to the non-OPEC reserve growth. With a couple of exceptions, all the non-OPEC countries started in 1980 with reserves of less than 20Gb. Saudi Arabia started with 168Gb. The basis for reserve growth is much larger than a single non-OPEC country. 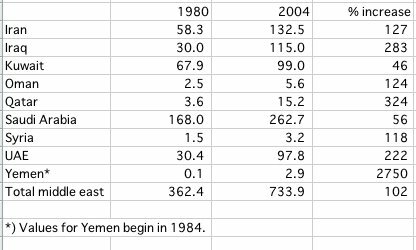 In fact, Saudi Arabia is equivalent to about 8 non-OPEC countries, and there doesn't seem to be anything unusual about their reserve growth over 24 years being in the neighborhood of 80Gb. It's also clear that a very large amount of reserve growth is not attributable to new discoveries. As I show in the next entry (#298), if we start with 1980 reserves, subtract production from 1980-2004, subtract the anomalous increases in OPEC reserves, and subtract discovery from 1980-2004, we still end up with 336Gb of reserve growth in non-OPEC countries which can't be attributed to new discovery. Where did that 336Gb come from? JD, have you read the Bentley letter yet? I think your analysis is off. BP statistical review talks of proven reserves which are not a reasonable measure of future recoverable oil. No I haven't read it all yet, but I will tomorrow. I'll post back here or on your TOD UK blog after I digest it. Thanks for the link BTW. The large growth in OPEC reserves appears suspicious. It could have been done to discourage non-OPEC countries from developing more competive strength either from exploration or from alternative sources. I don't trust OPEC's large increase in reserves. Kuwait cut its 2006 reserve numbers in half. Are they telling the truth now, but were lying in 1984? If one could trust OPEC, then one could comfortably enjoy the next 20 years without worrying about oil supplies failing to meet demand.